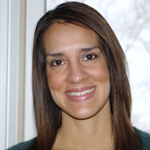 Cavazos-Rehg, a research assistant professor of psychiatry, and her team analyzed a subset of data from a large study documenting the prevalence of alcohol and drug use and associated psychiatric and medical conditions. The study identified 7,068 smokers and asked them how much they smoked. Three years later, researchers went back and asked the smokers the same question. 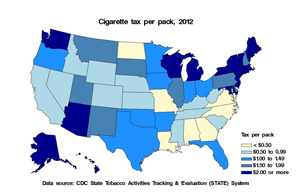 States tax cigarettes at different rates, from less than 50 cents per pack in Missouri, the Carolinas and North Dakota (shown in white), to more than $2 per pack in states such as New York, Massachusetts and Michigan (dark blue). The study found that higher taxes caused the greatest reductions in smoking among those who smoked the most. When the study began, the typical smoker averaged 16 cigarettes per day. After three years, that number had declined to an average of 14 cigarettes daily. During the period between the surveys, the price for a pack of cigarettes increased from an average of $3.96 in 2001 to $4.41 in 2004. Most of the increase was due to hikes in state taxes. The researchers found that individuals who smoked 40 cigarettes (two packs) each day would have been expected to cut back by 11 the number of cigarettes smoked daily with no price hike. But in states where cigarette taxes rose by at least 35 percent, heavy smokers lowered their daily smoking by 14 cigarettes, on average. Among those who smoked less, rising prices had less of an impact. Individuals smoking 20 cigarettes (one pack) per day, would have been expected to cut back by two cigarettes without a price increase, but in response to a 35 percent increase in price, they only reduced their smoking by three cigarettes a day. So in response to the higher taxes, heavy smokers cut back by an average of 35 percent. Lighter smokers smoked about 15 percent fewer cigarettes. The researchers also looked at other potential explanations for why smokers cut back, but no other factors were as influential as price. In addition, other factors may be at play. For example, Cavazos-Rehg says heavy smokers are more likely to develop serious health problems that could provide an extra incentive to quit or to cut back. Plus, heavier smokers are more likely to get encouragement to quit from a doctor or family member. Although the heavy smokers in this study cut back, she points out that health benefits are certain only if they stop altogether. Funding for this research comes from the National Center for Research Resources (NCRR), the National Institute on Drug Abuse (NIDA), and the NIH Roadmap for Medical Research of the National Institutes of Health (NIH). Support also comes from the American Cancer Society. NIH grant numbers are UL1 RR024992, KL2 RR024994, K02DA021237, K01DA025733, K02 DA021237 and R21 DA026612.